Magnolia Nobile is the latest from Acqua di Parma, and it joins 2004's Iris Nobile in what I suppose will now be the Nobile collection or somesuch. The inspiration reportedly comes from "the gardens of majestic villas along Lake Como, graced with magnolia trees", and that romantic, upscale vision is a pretty good prelude to the perfume itself. Magnolia Nobile starts off with fresh green citrus, in the same mode as the fresh green citrus that's in everything lately: Versace Versense, Bvlgari Omnia Green Jade, Chanel Cristalle Eau Verte. It's crisp and diffusive but lacks real sparkle, and I wonder if this is simply the new style, or if it's the result of the recent IFRA restrictions on natural citrus oils? Whatever it is, it does not make my heart sing: it's too fresh, and all of these perfumes remind me, to one degree or another, of functional products — nicely done functional products, to be sure, but still. I don't like my perfume to smell like it might be a spiffy new shampoo or luxury dryer sheet. After that, we've got the magnolia. Magnolia is a fragrance note that I love in theory, that is, I love the smell of magnolia, but magnolia perfumes usually leave me cold: magnolia, like lilac, is a fragrance note that so often smells clichéd, like an old-fashioned soap trio in a pretty-paper gift box. Still, I was hopeful about this one because I do adore Iris Nobile, and I often like the work of perfumer Antoine Maisondieu. It is not to be. The floral heart of Magnolia Nobile is pretty, even extremely pretty. It's sheer, and smells like magnolia with jasmine (I don't really notice rose or tuberose unless I concentrate, but they're listed in the notes, along with bergamot, lemon, citron, magnolia, jasmine, sandalwood, patchouli, vetiver and vanilla). It's bright and lively at first, with lemon-y/fruity undertones, paler and woodier in the later stages. It's very feminine and romantic, and it has a simple elegance about it, but in the end it's too clean, too dainty, to appeal to me. If you're looking for a light, clean, summer-y magnolia, not overly sweet, it might be just what you're after. There were complaints about the lasting power of Iris Nobile when it first launched, and eventually it came out in a much-altered Eau de Parfum version. Magnolia Nobile is launching in Eau de Parfum, but on my skin does not retain its verve for as long as the original Iris Nobile. 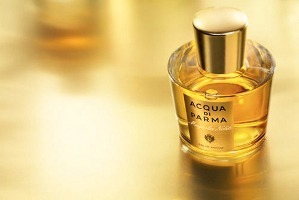 Acqua di Parma Magnolia Nobile is available in 50 ($105) and 100 ($165) ml Eau de Parfum; for buying information, see the listing for Acqua di Parma under Perfume Houses. I was disappointed in this one, too, R.
I adore the smell of fresh, creamy magnolia blossoms, but I have yet to find a fragrance that actually captures its enthralling smell. This one is not creamy enough to capture the real blossoms, R.
Robin mentioned you are the goddess of the magnolia scents so pls give us a hint on what to try. I love white florals, and I should discover more then jasmine I think. Thanks Robin! I’m curious about this one, since I’m on the hunt for a Magnolia I can fall for, but I’m wary, since Iris Nobile was just too sweet on my skin. And speaking of magnolia, will you be following up with any coverage of the new Avon/Reese Witherspoon In Bloom frag? There seems to be a big push for it — ads everywhere i turn — but the name Avon makes my nose quiver in fear. Have you tried the Bond No. 9 Saks 5th Avenue for Her? It opens with a strong magnolia note – I haven’t tried it on skin yet though, so I’m not sure how long the magnolia lasts. I might need to pull my sample out when I get home and give it a try – although I haven’t found any Bonds that I felt like I *had* to have yet. Okay, unless magnolias are supposed to smell like they’ve been dipped in feces, this one is a definite no for me! Smelled fantastic on paper – on skin, I started screaming “get it off, get if off” (in my head) almost immediately. I suffered through 30 minutes of the drydown before I finally resorted to a steaming hot shower to get it off of me. That’s the second Bond that’s been a total scrubber on me and the others have been “meh”. Maybe it’s time to give up and move on. Ack! I didn’t love the Saks, but can’t remember why — so I’m sure it was not as bad as all that on me! Not unless Avon sends me a bottle, and so far, the only one they’ve ever offered was Absynthe — and that one didn’t really interest me enough to review. I’ll take one for the team and try to track down a sample. I’m surrounded by Avon ladies. Do report back then! But do they even give samples? Not in the way any of us would traditionally think of samples. More like a moist towelette chock full of Avon-ly goodness. (Or badness, as the case may be.) At the very least I should be able to procure a scratch and sniff catalog. If there is an Avon kiosk in your mall, they might have a tester. I’ll keep an eye out the next time that I go. Yes, Avon samples are out there – I just received one with an Ebay order [it was thrown in w/my order as a little bonus]. I tried it – it’s the Reese Witherspoon one, and I didn’t care for it. I often have trouble with floral scents – this one has an artificial cloying aspect going on IMO. Miss Kitty – I will include this w/the other sample I’m mailing out to you [when I finally get around to it!] and you may be able to describe it better. Oh – and it’s not a towelette – it’s a little dab on bottle. Thanks RusticDove, good to know! I got a sample towelette of this today – will let you know if it’s any good. I have a cold so don’t trust my nose for now. wearing the avon in bloom today. i was surprised by show strong it was – i tried mark sophistique yesterday and it was so subtle, i thought the towelettes just wouldn’t provide a lot of sillage. anyway, yes it is pretty synthetic smelling. headache inducing, almost. i am also not a big fan of florals, but wanted to give it a try since i do love the smell of an actual magnolia. don’t think this one is worth a try if that is what you are looking for. Does not sound compelling, but have to wonder if it would do better w/ a “regular” sample instead of a towelette? Darn it. Had high hopes for this one. Robin/everyone: if this isn’t the HG of magnolia fragrances, is there another one out there that IS? The *third* Robin (violetnoir above) is the real magnolia freak, you need to ask her! As for me, I’ve really never found one I wanted to own. But will add: if there is a “reference” magnolia, I don’t know what it is! Hopefully somebody does who’s reading this thread and will weigh in. Sounds like I’m not the only magnolia lover here. While I’m not exactly a magnolia fan, I do remember Max Mara being a rather lovely (lemony, creamy) magnolia. Mind you, it’s on the sweet side. No! But my hopes still remain high. Amouage has a new one, Reflections, that’s coming out at some point this year. It’s supposed to be magnolia, but I’ll know if it is when I smell it. Is that different than the Amouage Reflection from 2007? I have a sample of that one, and to my admittedly novice nose, it’s very meh. And I have no idea what magnolias smell like, so I can’t even tell you if it’s a true magnolia. If either R would like to give it a sniff, I’m happy to pass it on (I’m under this same name at MUA). You mean something other than this one? I didn’t like that one much at all. Yeah, you guys could be right. It was an Amouage created by Dominique Ropion. I don’t follow the line that closely, but the one I am talking about was supposed to be a really beautiful magnolia fragrance. I read about it on one of the blogs, but can’t remember which one! Ugh! Sorry! Anyway, unless and until I smell whatever Amouage it is, the jury is still out on the perfect magnolia fragrance. Okay, I found it. It was Reflections (which I have never smelled and had not heard of), and the perfumer is Maurice Roucel. I’m done for now, lol! Yeah. Don’t think it’s going to be your dream magnolia. But of course I’ve been wrong before! I just got a moist towelette of this today (along w/Sophistique). Promise to report back after trying it – have a cold so I don’t trust my sniffer just yet. This was supposed to go under the Avon In Bloom thread – whoops! That’s ok, I figured…AdP doesn’t do those darned towelettes. I’m a sample snob — I want a vial! I’ve been really curious to try this, for some reason, and it sounds as if it could actually be nice in a simple, pretty way. I also still need to sample Iris Nobile. And I have always thought AdP bottles and design aesthetic are fantastic; whenever I see a bottle, I realize that they define elegance to me. It is nice, in a simple pretty way. I don’t think I’ll pay so very much for nice in a simple pretty way! I loved the original Iris Nobile & didn’t like the EdP, but I think that’s the opposite of how most people reacted. I am trying to think of a magnolia fragrance I really like, and am coming up blank, you’re right. Although … you know, I did like the Kenzo Magnolia very much, although to me it didn’t smell that much like an actual magnolia. Ditto — that was a really nice fragrance, but not a stellar magnolia. And come to think of it, I liked it better than this one. Ditto again…why won’t they ban dryer sheet smell? Did I hear someone just call the cynic? Because somebody owns a patent on dryer sheet smell and is making a mint! Ditto on “fresh” and ‘neutered patchouli” and…. the list is endless. Robin – I love these reviews! You are the master of understatement. I know, I love that so much. I tested this on skin the other week. Agree that the opening is clean, fresh and citrussy. The heart was buttery with hints of magnolia, but then there was this shampoo note that creeps up in some fragrances: cue Dior Addict. Cannot stand that. Such a shame! Yeah. Although if they really did make an identical shampoo, I’d probably buy it! I hate the smell of most shampoos. I was less than bowled over by Magnolia Nobile, too. Is there any company that does magnolia well, do you think? I sniffed the new HR Wanted at Geneva airport, which is supposed to have magnolia as a note, and it just seemed to be Big Shoulders furniture polish perfume, along the lines of Armani Idole. Nothing seems to capture the waxy luminosity of a magnolia in full bloom. Oh dear, and I was looking forward to smelling that — assuming it ever gets to the US. Wanted is indeed nice, but it is fresh citrus-sy flowery and I would not have smelled mnagnolia out. I once smelled real magnolia in the park, they are something completely different. I would send you my WANTED bottle straight away, but it’s not aloud, or? From Europe? WANTED is L’Oreal Luxury Division. Reminded me strong of Champs Elysee but without being quirky. More grown-up elegant and… (boring)modern. It does not sound like something worth shipping from Europe, does it? But kind thought, thank you! Honestly? I do not think it will blow your mind, but I would immediately so pls just give me a hint! Got a sample of this last week – like you, I was reminded of soap, Roger & Gallet Magnolia, to be precise. I think I like the soap fragrance rather better, though, that one is creamier and denser than Magnolia Nobile. It’s duller than I expected, and I’m not much of a floral girl, so I had no high hopes to begin with. Maybe I need to try the R&G! I do love their soaps. You should! It’s a nice magnolia, and their soaps are always such a treat. R, if the lifeless, vapid, dry citrus of the recent launches you mention (I’d lump A Scent by Miyake in the same group) is what’s supposed to replace natural citrus oils, I might as well shoot myself. Or give up on perfume altogether. Seriously. I can’t make up my mind about A Scent. It does have that same opening, but for a non-perfume scent (does that make sense?) it’s got its charms. But I didn’t adore it either. And yeah, agree: it’s a crying shame. I have a feeling “citrus” as a category is near its death. I hear you on A Scent. It’s lush, it’s ‘wet’, strangely limpid and ‘organic’, but ultimately it doesn’t grab me. I guess I like the concept better than the end result. Oh I know eggsactly what you mean, I was left with the same impression. And you reminded me that I need to get a bottle of the Cologne already, it’s such great stuff. Have you tried the Body Milk? It’s amazing! LOL…not really meant that way — I love TM Cologne! And Dusan, no, I’ll have to look for the body milk. Thanks for the review, Robin! I’ve been playing with this one for the last fortnight and I can’t quite make my mind about it. I think that I might set my samples aside and wait until warmer weather to see how it fares then. There’s a Summer Floral shaped hole in my fragrance wardrobe and this one could possibly still be a contender. The other one one is OJ Frangipani, which to me has a similar feel of fresh, dew-drenched flowers but possibly more interesting than Magnolia Nobile. I do think it would make a much better showing in summer. But will also vote for the OJ as a more interesting alternative — it’s one of my favorites. But wonder if those are being reformulated too…haven’t heard anything. Who knows! They changed the packaging recently, didn’t they? Perhaps the juice is new too. I’m really looking forward to their Tiare. OJ folks said end of Oct – beginning or Nov so hopefully it won’t be long now. I’m looking forward to Tiare also! Thanks for the review! I was interested in trying this. Now not so sure. Count me as a fan of Magnolia Romana, but I know I’m probably in the minority here. Maybe it’s because I don’t use dryer sheets, LOL. If you loved MR, you really should try this. They’re not at all the same, but still…means you’re probably looking for a different sort of magnolia than I am! The creme is wonderful, not too heavy and beautiful on. Too bad, I was hoping for a languid, dreamy Southern magnolia – this was on my list of possible FBs, I love magnolia so much. You might love it, but going to be really surprised if you find it languid & dreamy. I wanted to like it too. i smelled iris nobile and liked it , i want to try magnolia ! by the way thank you robin , i have learned so much about perfumes i probably would have never tried l’artisan without the reviews and now i am hooked !!!!!!!! I love the smell of magnolias, had a huge tree in front of our house growing up. I don’t know about this one, have to try. I got my hopes up when I tried the new Cristalle Eau Vert, which was very pretty to start, then morphed to meh with no lasting power. I think it may be my chemistry. Don’t know if you’ll be happy w/ the lasting power of this one either, although it’s certainly more magnolia-ish. I had been thinking along these lines (since AdP is Italian) and finally did the wikipedia thing. Appears there are tons of different magnolias and ostensibly they don’t all smell the same as the big, creamy flower of the Southern US that some of us are used to. I’ve even been noticing different types of trees around town here in Santa Barbara. In any case, maybe these perfumes capture the scent of SOME variety of magnolia — perhaps native Asian varieties are more common in Europe? Just a thought. Great review, as ever Robin, though I would say that having tried Magnolia Nobile today, I surprised myself and rather liked it. I wouldn’t buy myself a bottle because I am not necessarily attracted to florals, but for me the tuberose was more evident than for you, and this gave the perfume a kind of depth and solidity it would not have otherwise. I’d rather like it as bath oil! Don’t write it off in any case. Iris Nobile, is, as you say, sensational. So glad you liked it! I’m guessing it will end up with more fans than the iris (the EdT, anyway) which seemed to be very much a “love it or hate it”. I just received a sample of this and I love checking NST reviews after I try a new scent. I’m on my second day of trying it. At first wearing, I thought it was a bright, clean floral, especially when the magnolia pops in the beginning. The middle for me was just an elegant, if generic, floral – I wasn’t getting a lot of the jasmine or tuberose. But now that it’s dried down, I definitely smell the patchouli, it’s like a mix between SJP’s Lovely and O’Glue (if anyone remembers that from their school days!) Not for me.